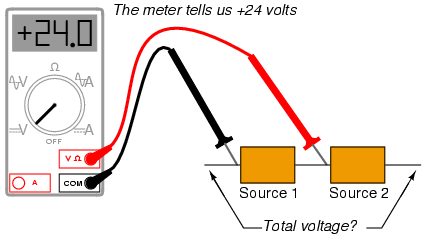 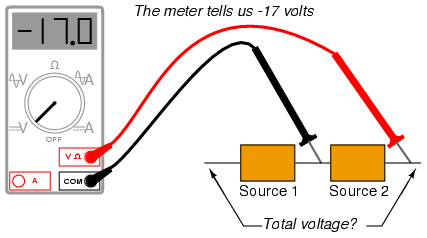 Interpreting such notation might be easier if the “+” and “-” polarity markings were viewed as reference points for voltmeter test leads, the “+” meaning “red” and the “-” meaning “black.” A voltmeter connected to the above battery with red lead to the bottom terminal and black lead to the top terminal would indeed indicate a negative voltage (-6 volts). 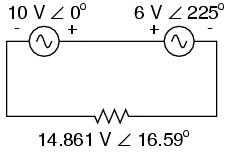 Actually, this form of notation and interpretation is not as unusual as you might think: its commonly encountered in problems of DC network analysis where “+” and “-” polarity marks are initially drawn according to educated guess, and later interpreted as correct or “backward” according to the mathematical sign of the figure calculated. 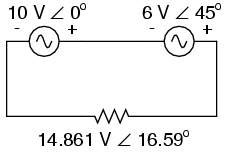 Unlike DC voltage sources, whose symbols intrinsically define polarity by means of short and long lines, AC voltage symbols have no intrinsic polarity marking. 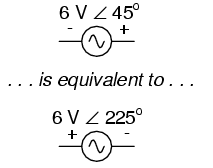 Therefore, any polarity marks must be included as additional symbols on the diagram, and there is no one “correct” way in which to place them. 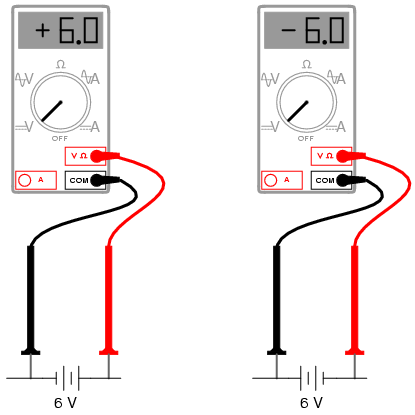 They must, however, correlate with the given phase angle to represent the true phase relationship of that voltage with other voltages in the circuit.